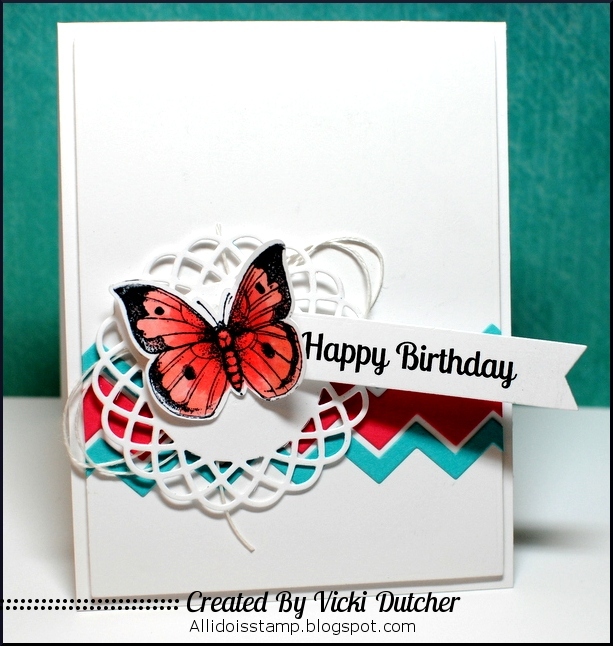 I love the vibrant colours, the chevrons and the butterfly so wanted to use these in my card. I created a circle window card and then used Distress Inks in Barn Door and Peacock Feathers to ink the circular frames. I heat embossed the vellum with Uniko Studio’s Background Builders: Chevrons and then sandwiched this between the card base and the circular frames to hide any glue. I created the “Flight” part of the sentiment with my Silhouette then coloured it with the Peacock Feathers Distress Ink. 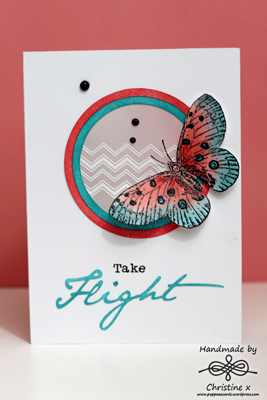 The butterfly image is from Urban Stamps – stamped and embossed in Versamark Black Onyx ink and shaded with the Distress Inks. Love how you’ve used all the elements of the Muse, but truly made it your own! Thanks for joining us this week! Great card. I love the pops of color. Great job coloring the butterfly. It is beautiful. So totally love how you were inspired — great use of the colors~ Thanks for joining in at MUSE. Very beautiful! I love the teal and red butterfly! Love the colour scheme. Your take on the MUSE card is absolutely stunning! I love your use of vellum and that you used both colours for your butterfly. Lovely card. I saw ur winning card at Muse and couldn’t resist visiting… this is stunning!! I can’t get my eyes over it 🙂 congratulations ! !